Cedar wood is a lightweight and dimensionally stable wood that lies flat and stays straight, which means it resists the natural tendency to crack and check that mars the performance of many other wood species. Its distinct cell structure discourages moisture rot by allowing it to dry out faster than outdoor furniture made from tropical hardwoods. 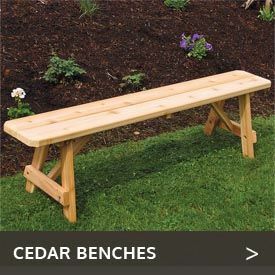 Western red cedar is incredibly thermal coefficient, meaning even on hot days, it is cool to sit in..
Its bacterial and fungal resistance coupled with the fact that cedar has 80 percent of oak’s strength makes cedar the most desirable wood to use for building outdoor furniture. Western red cedar fibers contain oils that act as natural preservatives to help the wood resist rot and decay, making it excellent furniture material for moist or humid climates. 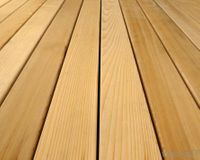 These properties also make cedar a very popular material for hot tub and sauna areas. Among other things, naturally occurring organic compounds called thujaplicins give off that distinct cedar aroma that is pleasant to humans but a deterrent to insects, moths and other wood pests. This makes Eastern aromatic red cedar the choice material for closet liners and blanket storage chests. Its wonderful aroma and pest resistance makes cedar the perfect material inside or outdoors. Cedar closet lining benefits include giving your garments an attractive scent while protecting them from damage. 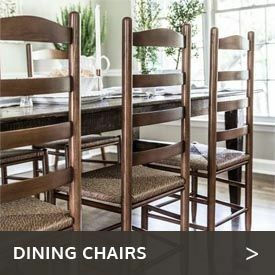 Whether you are looking for an indoor cedar storage chest or an outdoor cedar table, chair or storage box, cedar for furniture is the natural choice. Unlike plastic or resin furniture, Western red cedar will not bow or sag over time or blow across your yard. Your cedar furniture will hold its handsome appearance year after year with very little maintenance. 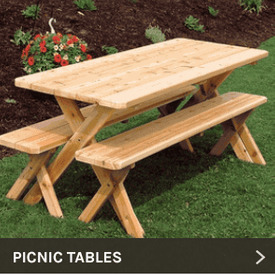 Cedar and our Southern cypress products are an all-around safer, healthier and natural alternative for patio furniture and outdoor dining sets compared to other wood materials that have been treated with chemical preservatives. These products are also safe for organic gardening if the wood is left unfinished in its natural form. Our cedar and cypress products are a natural alternative to chemically treated wood. Much of today's outdoor furniture consists of chemically pressure-treated materials. These materials hold up outdoors because they are soaked in a toxic stew of chemical preservatives that are strong enough to require warning labels for those who handle them. The three primary ingredients in pressure-treated woods are copper, chromium and arsenic (CCA). A controversy exists on the extent of arsenic exposure from physical contact with CCA wood surfaces. Such surfaces include playground equipment, decks and picnic tables built using CCA-treated wood. Studies have shown that virtually no inorganic arsenic is absorbed through the skin, but it is readily taken up by ingestion. Thus, the potential exposure is hand to mouth. Children are considered the most vulnerable to this risk. Contact your local government environmental department for more information. From northern British Columbia, Canada, to California, a rugged spine of mountains stretches for almost 1,500 miles parallel to the Pacific coast of North America. Along the slopes and in the valleys of these mountains, the humus-rich soil nourishes mixed softwood forests in vast abundance. The majority of Western red cedar (Thuja plicata) grows in coastal forests. Western red cedars also occur in the drier interior forests of British Columbia, Washington, Idaho and Montana, where they are smaller and more tightly knotted. Aromatic red cedar is a member of the juniper family. Cedars rarely grow in pure stands but are generally found in association with other species. Western red cedar forests are predominantly managed forests, in which controlled harvests, natural regeneration and reforestation programs ensure a perpetual harvest. A red cedar log is composed of white and red sections of wood. The white section nearest the bark is referred to as "sapwood," and the red, inner section is called "heartwood.". Whether used in patio furniture, paneling, ceilings, doors, windows, posts or beams, the presence and prestige of cedar enhance the aesthetics of any design. Western Red Cedar "heart wood" contains natural oils that act as preservatives to help the wood resist insect attack and decay. Properly finished and maintained, Western Red Cedar ages gracefully and endures for many years. Aside from being the choice material for Outdoor Patio and Garden Furniture, Cedar is the preferred material for all outdoor applications that seek visual harmony with the landscape combined with stability and durability. Various uses range from furniture products to siding and patio decking, fences, planters, screens and shelters. Indoors, cedar's dimensional stability makes it perfectly suited to a variety of uses in high moisture areas such as kitchens, bathrooms and saunas. Beauty aside, the purely practical, dollars-and-cents value of cedar offers other benefits: The wood's cellular structure creates interior air spaces that give it an insulation value higher than most woods and much higher than brick or concrete. Buildings that feature cedar paneling, ceilings or siding tend to stay cooler in the summer and warmer in the winter. Cedar also has excellent sound suppression and absorption qualities. The same structure that gives cedar its excellent insulating and sound-suppressing qualities makes it a lightweight wood, easy to handle and craft for both the professional and do-it-yourselfer. Cedar is a pleasure to work with using either hand or machine tools. The wood can be cut, shaped, planed, sanded, nailed and glued easily. It is free of pitch and resin, and it finishes to a richly glowing surface that can be enhanced with semi-transparent or full-bodied stains. Because moisture is a factor in the checking process, the depth and span of the checks will vary upon placement outdoors. Direct sunshine contributes to the drying of logs, widening their cracks. Moisture and indirect light will shrink cracks. Although white cedar possesses much of the same cell properties of Western red cedar, which makes them both desired woods for outdoor use, it contains much less of the natural acidic tannins that help to preserve Western red cedar. Therefore, white cedar will not last quite as long as Western red cedar wood. White cedar outdoor furniture nevertheless is beautiful, durable and easy to care for. You may be wondering about cypress vs. cedar outdoor furniture. The cypress tree grows mainly along southern coastlines and inland areas. The tree produces an oil called cypressine that acts as a natural preservative within the wood. This inherent characteristic of the Southern cypress makes it durable and extremely resistant to harsh weather conditions, insects and fungus. Because cypress wood lacks sap and doesn't bleed, it takes well to sealers, stains and paints. Its color varies in shades of light to dark honey. If left outdoors unfinished in its natural state, the appearance of the wood will become a light pewter color over time. The lumber is lightweight, scarce of knots, medium textured and dimensionally stable with a closed, straight grain. It is easy to cut, saw and nail, and resists splitting, warping, checking, splintering and cracking. Cypress wood complements any interior or exterior architectural style, whether rustic, traditional or modern. Cypress siding has been used for years on coastal and resort homes. It was also used by colonial builders for their homes, barns, cotton gins, warehouses, boatbuilding and docks. Cypress wood has even been reused from 100-year-old structures. Other beneficial uses today include porches, bridges, shingles, shutters and greenhouse construction. Copyright@ ADAMS All Natural Cedar. Contents of this website including custom graphics, site design, textual descriptions and information may not be copied or reproduced without express written permission.